I Have a Small Telescope, What Can I See? A70Lf telescope with Portamount. Illustration courtesy of Vixen Optics. The title of this article poses a good question. The answer depends on the actual size and kind of astronomical telescope you have and on your experience as an observer. The observing ability will come with time and experience, so in this article I will attempt to address the telescope part of the equation. Astronomical telescopes are generally described by their clear aperture (never by their theoretical magnification), which is analogous to rating motorcycles by their engine displacement. In both cases, these are merely convenient ways to measure general capability. For the purposes of this article, we are going to consider the absolute minimum "serious" beginner telescope to be a refractor with a clear aperture of at least 60 to 70 millimeters (2.4" to 2.75"). To be useful, even the most basic astronomical telescope must be of good optical and mechanical quality and use 1.25" eyepieces of equally good quality. Such telescopes are not usually sold in department stores. They are sold in specialty stores and come from a specialty telescope company, such as Stellarvue, Takahashi, Vixen, Celestron or Orion. If you had the foresight (and available funds) to buy an 80mm/3.2" or 90mm/3.5" beginner scope of good quality (which I recommend), you will be able to see more detail in the objects mentioned below, as well as dimmer objects. 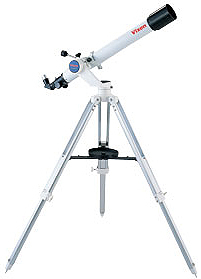 Further, a good mounting system is as important as a good telescope and probably harder to find. We are going to assume a mounting system, either alt-azimuth or equatorial, of adequate size and rigidity to make the telescope suitable for astronomical observation. That means the mounting system must allow very precise aiming and hold the telescope steady when it is being focused or touched (not bumped). In general, telescopes and mounts sold by Tasco, Jason and Bushnell or as department store house brands do not meet these criteria. A good 60mm refractor will also allow seeing, but in most cases not examining in any significant detail, all of the 110 Messier objects, which are the most popular deep sky (beyond our solar system) objects. Most of these will look like dim, fuzzy spots through a small telescope, but you can find them. The Messier objects are a collection of distant galaxies, star clusters and nebula that were discovered during a diligent sky survey conducted over a period of years by Charles Messier. He used a refracting telescope smaller and less capable than a modern 60mm refractor. Today, the Messier Catalog is generally regarded as objects for 4" (100mm) and larger telescopes, but it is amazing what a dedicated observer with a 60mm or 70mm scope can accomplish. Naturally, there are a great many deep sky objects not catalogued by Messier and his assistants that can also be observed by amateur astronomers with small telescopes, as well as all sorts of variable stars, double stars and stars of various colors. Many sky maps and catalogs include information about objects visible through small telescopes and binoculars. Thus, while a larger telescope can generally see more objects than a smaller one (aperture rules! ), the answer to the question posed in the title of this article is, "Quite a lot--hundreds of interesting astronomical objects, in fact!"